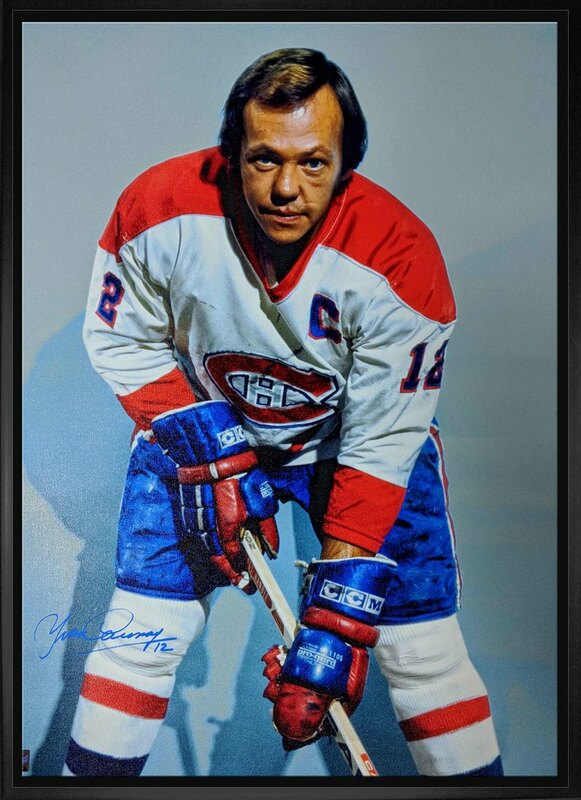 This canvas comes personally autographed by Canadiens Hall of Famer, Yvan "The Roadrunner" Cournoyer. The Quebec native was known for his small size and blazing speed on the right wing. Cournoyer earned a Conn Smythe after tallying 15 goals and 10 assists in 17 games to lead the Canadiens to a Stanley Cup in 1973. February 15th, 1975 Cournoyer scored 5 goals in a single game to be the 20th of 44 players to achieve this feat. Cournoyer captained the Montreal Canadiens from 1975 until his retirement in 1979. Cournoyer finished his career with 10 Stanley Cup rings and captained the team to 4 straight as the captain in 1976-79. The image has been printed on to high quality art canvas and is professionally stretched and mounted on the back of a 3/4" deep wooden frame. A Frameworth hologram and certificate of authenticity are included to ensure the legitimacy of the signature. Frameworth is an official licensee of the NHL & NHLPA. Frame Size: 22x31".